Days before the beginning of the greatest sports event in 2016 our attention is gradually turning to the forthcoming beach volleyball tournament at the heart of Brazil. Most of the top teams in the world had gathered enough points from the FIVB World Tour in order to earn an Olympic quota. The Hamburg Major, the first of the Swatch Major Series in 2016, was the last World Tour qualifying event. 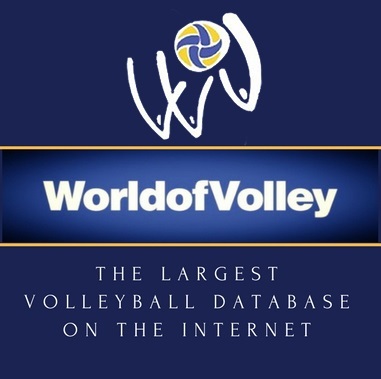 Continental distribution saw Qatar, Tunisia, Chile, Austria, and Cuba gain draw berths, whereas Russia, and Canada were the fortunate winners of the international FIVB Continental Cup. There was a winner-takes-it-all Canadian playoff that was won by Josh Binstock & Sam Schachter in three sets (20-22, 21-17, 15-12) against Pedlow-O’Gorman. Binstock-Schachter was the last, 24th, beach volleyball team to qualify for the Games. 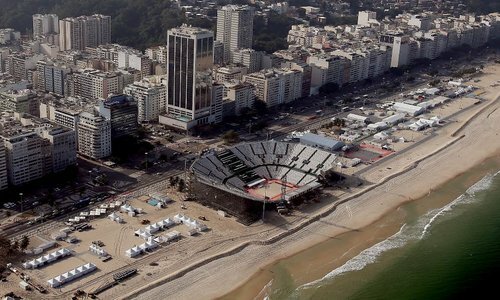 Although athletes and journalists on site in Rio question the overall readiness of the organizers, the first pictures of the beach volleyball arena were released recently and I have to say it looks spectacular. Let alone the fact that Copa Capacabana is an iconic location, the arena promises and exciting tournament and could be the best one to ever hold a tournament of such magnitude. We take a look further back now as earlier this year Asia and Europe held their annual continental championships. Manly Beach, on the outskirts of Sydney, Australia, hosted the 2016 Asian Beach Volleyball Championship and turned out to be an all-Australian affair. Three “kangaroo” teams ended up taking the medals at home. The winners were familiar faces to the beach volleyball audience – Australia’s top-ranked pair and a two-time Asian champions Isaac Kapa and Chris McHugh. In the final they defeated fellow countrymen Bo Soderberg and Cole Durant in three sets (21-10, 19-21, 15-9). Josh Court and Damien Schumann grabbed the bronze medals. Biel/Bienne (Switzerland) on the eastern shores of the Biel lake hosted the 2016 European Championship in June. For the second time in history the title went in Italian hands. 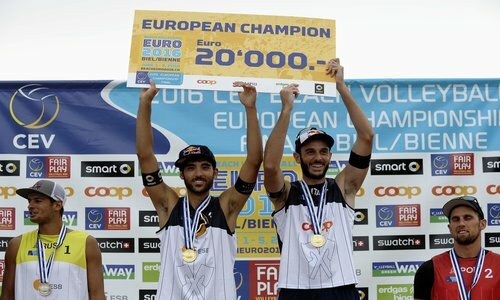 Just as in 2014 when they dominated the home event in Cagliari, Paolo Nicolai and Daniele Lupo demonstrated a good form and swept their competition. The sixth-seeded Italians beat the Russians Konstantin Semenov and Vyachelsav Krasilnikov in a thrilling three-set encounter (21-15, 13-21, 15-12). It was Russia’s first-ever medal position at European championships. Poland won its second pair of bronze medals in history as Grzegorz Fijalek and Mariusz Prudel, just like in 2013 in Klagenfurt, Austria, scored a victory in the penultimate tournament match. The Poles defeated the 2013 world champions Alexander Brouwer and Robert Meeuwsen from the Netherlands in straight sets (21-17, 21-19).